If you have a lot of windows open on your desktop at any one time, it can sometimes be difficult to manage them, especially if you need to compare two documents, or move files from one window to another. 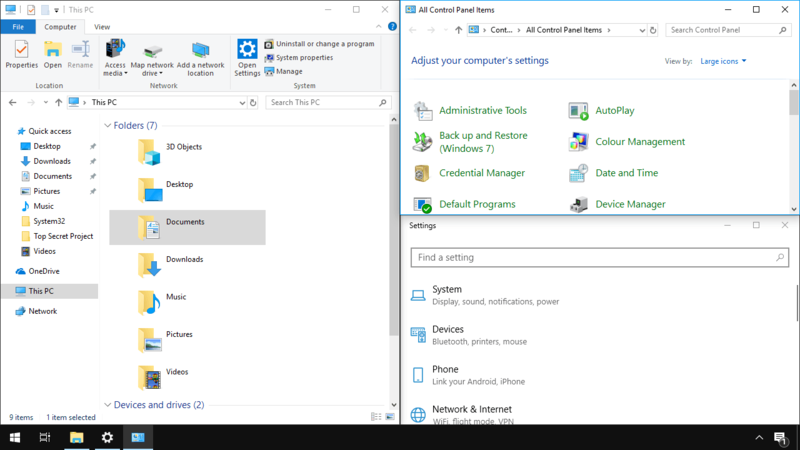 In Windows 10 though you can use a feature called Snap to pin windows to the left and right, or the four corners of your screen. You can achieve this by dragging a window to one side, or one corner of your screen where you will see an outline appear of how the app will snap. If you have any other apps running, then their thumbnails will appear so you can click one and have it automatically fill the remaining space. Additionally apps aren’t fixed when your using them in snapped mode. It’s possible to drag one side, or the top or bottom of an app and make it larger or smaller. This will automatically resize the other apps so that the space you create is filled, and it can be a useful way to make sure an app isn’t larger than it needs to be. If you want to quickly snap and app to the left or right of your screen, you can also achieve this by pressing Win + left / right cursor. Additionally, using the Windows key with the up and down cursor keys will maximize and minimize the currently selected app.